This small sign measures 10″ by 14″ and is an interesting design. 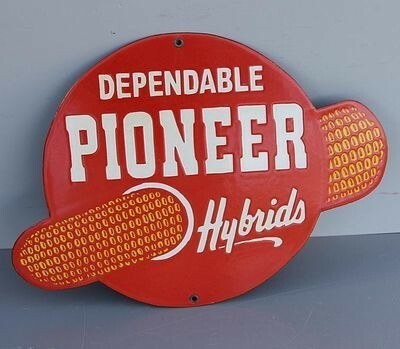 The text on this red sign reads “Dependable Pioneer Hybrids.” Running through the center of the sign is a corn cobb. This is a die cut porcelain sign that is most likely single sided. There are mounting holes at the top and bottom.